I became interested in making maps, originally, because I recognized their power to help students visualize their world around them. I was looking for a social justice tool I could use in my classrooms while teaching history and civics to underprivileged inner-city youth. In the three years I've been making maps for Tutor/Mentor Connection (T/MC), to help build programs that help students everywhere, I’ve come to understand that mentoring doesn’t just help the students. It helps you and me in ways I had never considered. My new challenge has become convincing those who are living comfortably that poverty and poorly-performing students might be their concern too. And that my maps can help all of us if they fall into the right hands. If you haven't already tuned me out, let me continue by saying I understand your apprehension. Like many "successful" Americans, you and I share an industrious work ethic, are pretty competitive, and have worked hard to earn our achievements. So on some basic level, I understand the befuddled look when I suggest you should invest in others who haven’t "earned theirs." On the other hand, let's talk about a sluggish job market and a fickle economy. These are issues that we should be talking about, right? Here’s the thing: All of this – uplifting the poor, our current economic woes and America’s economic future - while not exclusively related (after all, there are a myriad factors that play into our economic mess), aren’t completely unrelated either. So here's another attempt at grabbing the attention of "successful" Americans everywhere by showing how poverty probably affects even you. First, note empirical “cost of poverty” reports that have estimated the costs to the U.S. associated with childhood poverty at $500B per year, or the equivalent of nearly 4 percent of GDP. The Alliance for Excellent Education further estimates that high school dropouts from the class of 2006-07 alone will cost the U.S. more than $329 billion in lost wages, taxes and productivity over their lifetimes. Just yesterday, AP Business Writer Pallavi Gogoi reported on the nasty phenomenon of companies outsourcing/offshoring more and more American hires and resources, writing that corporations might simply be going to where the markets are booming. “Sales in international markets are growing at least twice as fast as domestically,“ he reports, and “by 2015, for the first time, the number of consumers in Asia's middle class will equal those in Europe and North America combined.” Jeffrey Sachs, globalization expert and economist at Columbia University, attributes this shift, in part, to the improving "quality of the global workforce," explaining that "we are not fulfilling the educational needs of our young people,” and emphasizing that "what's changed is that companies today are getting top talent in emerging economies, and the U.S. has to really watch out." Honestly, I never set out to find these connections between students and our economy when I first went down my “mapping for social justice” path. It’s becoming clear however, the more I search for ways to justify what I'm doing with my maps, that I’m not the only one talking about this emerging relationship. Business and political leaders are starting to make noise about tutoring and mentoring as part of long-term comprehensive plans toward making America's markets more competitive. The late Senator Ted Kennedy introduced and passed legislation encouraging "more organizations across the Nation, including schools, businesses, nonprofit organizations and faith institutions, foundations, and individuals to become engaged in mentoring" citing research and strong evidence "that mentoring can promote...an increased sense of industry and competency, a boost in academic performance and self-esteem, and improved social and communications skills." Locally, Urban Prep Charter Academy for Young Men, in impoverished and gang-torn Englewood on the south side of Chicago, has put a mentoring program to action, and helped turn107 of 150 incoming freshmen (who were reading at a sixth-grade level when they arrived four years ago) into four-year college students, preparing them for our workforce and as new consumers... instead of potential tax burdens on our streets, in our welfare lines, and - in worst case situations - the correctional facilities we all pay for. 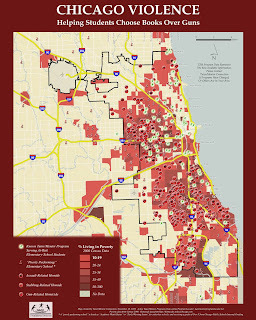 T/MC maps can help business leaders and policy makers who are interested in this connection between our economic well-being and tutoring/mentoring programs by exposing where at-risk youth live, and where new programs, like the one at Urban Prep, might be needed in their neighborhood or political district. The maps can then be used by these community leaders to rally support from the business community for the programs that do exist. 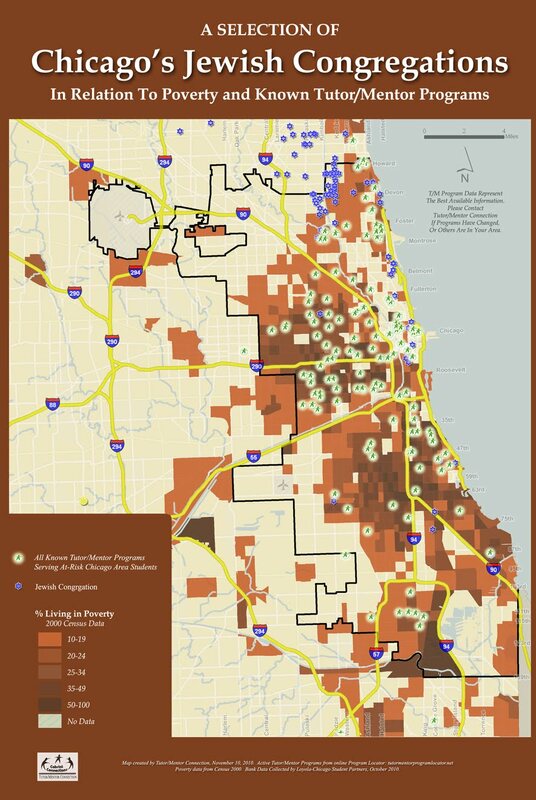 For example, the map at the top of this post (click on it to expand) showcases the poverty, schools, and all business assets in Chicago's West Town neighborhood, where Cabrini Connections tutor/mentor program operates. 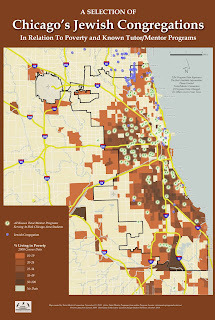 Cabrini Connections can use this map to find potential partners that want to connect employees with kids in local schools, to influence reading, writing, critical thinking, and learning habits, and then build long-term relationships with the students to ensure more youth from neighborhoods like West Town are working in their companies, or are their customers, when the kids are adults. Now I'm no economist, but it seems to make common sense the more I read, that if this investment in mentoring was happening in every neighborhood at maximum capacity, we could put a dent in the costs of poverty to us taxpayers, while potentially offsetting some of the growing economic disadvantages that are emerging and causing American companies to take their business elsewhere. 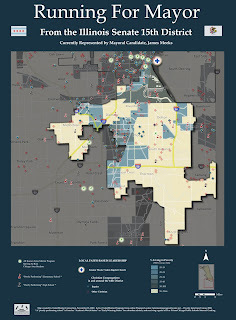 We at Tutor/Mentor Connection (T/MC) have spent the past several years using maps to identify and analyze areas of our city where support for at-risk youth needs to grow, in order to make our students brighter, our workforce stronger, and our streets safer. We operate on a non-profit budget and rely on donations and charity to continue our work, using state-of-the-art GIS technologies in support of our community-based mission. Please consider a small tax-deductible donation to this important charity this holiday season. Christmas Week! Charity, Kindness, and Love... with Maps! Doing Unto Others this Christmas Season with Maps. Earlier this month, our Jewish friends celebrated Hannukah. This week, we're rolling quickly into Christmas. I am not a spiritual leader by any means, but it's hard to not find a common message, shared across faiths during the holidays: People of faith are encouraged to give as well as receive. 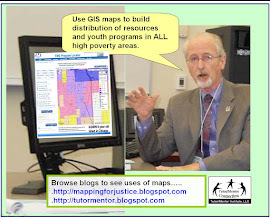 I have been helping Tutor/Mentor Connection (T/MC) make maps since 2007, as part of a mission - and often at great personal sacrifice - to help maximize the number of at-risk youth making the best decisions they can. Our efforts supplement the barrage of negative news we get about economy and crime - with solutions - working to guide at-risk and marginalized, yet able and willing students (some of whom may be otherwise lured to the streets, and many of whom simply need a little extra attention) so that they aren't everyone's problem later. 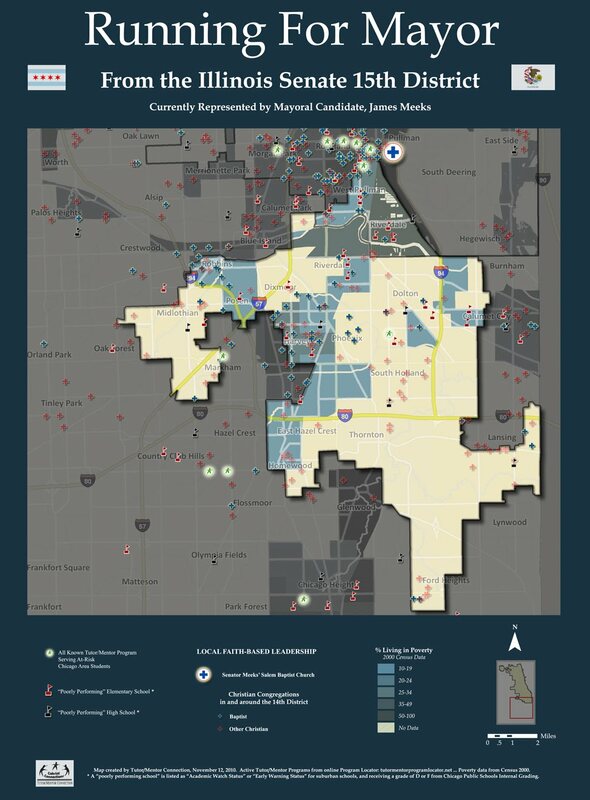 Our maps are designed to help politicians, faith-based, and other community leaders locate areas where these students live, and then build tutor/mentor facilities to help the kids onto paths that lead to college and career, versus welfare and crime. As an added bonus to you, through our community service, T/MC maps support strategies that can work toward improving everyone's general safety, while fighting the cost of unemployment and poverty to taxpayers of all backgrounds everywhere. Like all Non-Profit Organizations (NPOs), we rely on continued support and contribution from the community. Thanks to everyone who has supported these efforts in the past. I hate to have to continually raise funds, but with NPO donations at a 20-year low, many services like ours are threatened to disappear now more than ever. And I think you'll agree, especially after reading those links above, if we aren't making an effort to uplift children from families in poverty, who will? And what will be the cost to us all if we fail? Please consider a small tax-deductible donation to this important charity this holiday season, to help this work continue into 2011. Note: since 2011 the Tutor/Mentor Connection has been operated by Tutor/Mentor Institute, LLC. While this is not a tax exempt organization, it still depends on contributions to continue this work. Please consider a small donation this holiday season. The holiday bustle is intensifying a bit this week - if the crowds joining me on my commuter train into the city, to do last minute holiday shopping I presume, are any indication. Like everyone else, I'm hopeful these shoppers somehow provide a jolt to this rough economy. "Holiday retail sales are a modest 3.4% of the U.S., economy, and that...it seems the importance of holiday retail sales in the economy is being overstated." "If we really want to assess the health of the economy, perhaps we should focus on the numbers that reflect the big picture, such as employment, capital investment and personal incomes." As we've seen this month on this blog, the Tutor/Mentor Connection (T/MC) "Mapping Solutions" map gallery contains sample maps that show how T/MC data and strategies can be used by politicians, faith-based leaders, and media, to make our streets safer, and address the cost of unemployment and poverty to taxpayers. 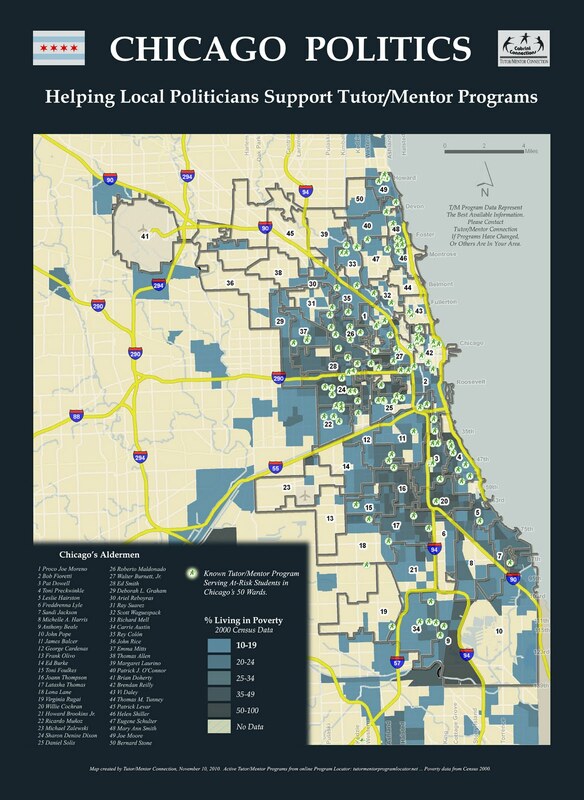 We also have a selection of maps that show where the business community can invest in tutoring and mentoring to help talented kids who are lost in high-poverty neighborhoods reach their academic potential, become more employable, and ultimately put dollars into their pockets and in turn, into the economy. This map above (click on the map above to enlarge) shows all area banks, in relation to high poverty, poorly-performing students, and known tutor/mentor programs. Banks can take the lead investing in tutor/mentor programs, long-term, as part of their own human capital development. They can also lead an ongoing effort to recruit talented, dedicated staff and volunteers who will make long-term commitments to being part of such programs. Read more about strategies for businesses here. "We're encouraging a mix of philanthropy, volunteering, and workforce development. "We want companies to invest in strategies that connect employee volunteers with kids in elementary school, so that they influence reading, writing, critical thinking, and learning habits. "We want these companies to stay connected to these same kids through middle school, high school and even college, so they can influence work aspirations, and provide a range of part time jobs, internships and scholarships, that assure more youth from poverty neighborhoods are working in their companies, or are their customers, when the kids are adults. "Most of all, we want them to develop strategies that reach youth in all areas where they do business, or where employees might live, not just in a few chosen places where they might have a high profile involvement." We can easily map other industries beside banks, but chose to unleash a group of Loyola University GIS students on the banking sector. Thanks to them for collecting and ensuring the accuracy of this bank data. Check back this week for new samples of T/MC business maps, and another look at how we are helping you and your business network invest in tomorrow's workforce, for the good of our economy. 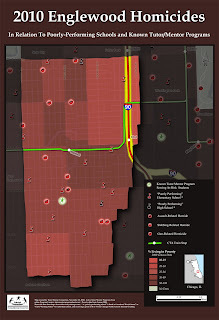 2010 Englewood Homicides. Mapping For Solutions. My most recent blog in this series of maps featured an overview of Chicago’s 2010 homicides, and discussed just how significantly poverty and school performance factor into predicting a community’s risk for crime. I then looked at empirical evidence that shows how students that are enrolled in mentoring programs do better in school, are less likely to do drugs, and are less violent than students with similar positive aspirations but no mentors. I was discussing this with a colleague (volunteer Tech Club leader for Cabrini Connections tutor/mentor program, Anne T. Griffin) and the discussion reminded her of an article she had read in last week’s Wall Street Journal, called Mentors Give Hope to At-Risk Students. The article reports the dramatic success story of a high school located in the notoriously impoverished and crime-riddled Englewood community of Chicago, focusing on the school's incorporation of mentoring into its curriculum. Urban Prep Charter Academy for Young Men employs full-time mentors, who “serve as confidants, counselors and parental figures to the boys, many of whom come from broken homes in gang-ravaged neighborhoods.” Four years ago, the article tells us, 80% of the 150 incoming freshman read at a sixth-grade level or below. Four years later, 107 of those 150 young men graduated this year, with all accepted to four-year colleges. 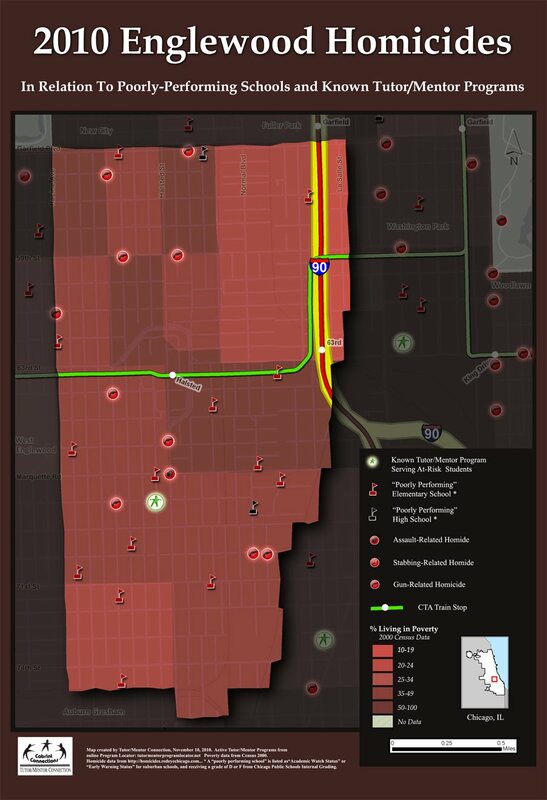 (Feel free to click on the map above to get a sense of Englewood’s violence, poverty, many less-successful schools, and noticably-lacking mentor resources (we know of only one non-profit program available to the Englewood students who aren't enrolled at Urban Prep). Note that Urban Prep is not on this particular map since schools on this map are “poorly-performing.” If you are interested, it is located next to the highway on 62nd street, just north of Reed Elementary, the “poorly-performing” elementary school on the map that appears to be split by the "Green Line," near the "63rd Red Line" stop). So here we have a case that seems to fit the discussion from yesterday’s blog. Against a backdrop of high poverty, many poorly-performing students, and the violence that is predictable under these conditions, we have a program where young men are succeeding against the odds and on their way to college, due in large part to the guidance of one-to-one adult mentoring. With stories like this, it would make sense at some point that more policy makers might prioritize mentoring as part of their education platform, in an effort to improve our general safety, our nation’s dropout crisis, and the cost of poverty to taxpayers of all backgrounds everywhere. 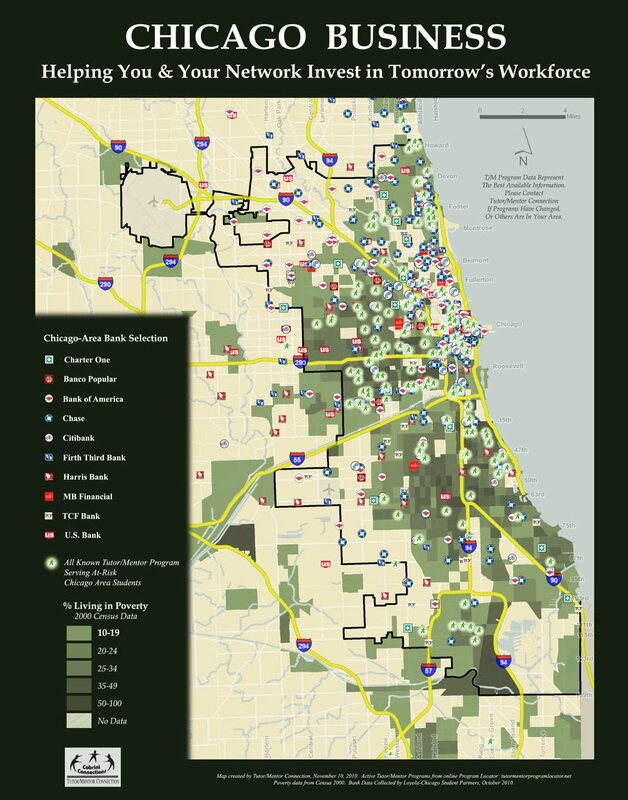 Looking at our maps, I wonder if an alderman with Rhymefest's visibility, energy, and power of communication might take the lead in building new mentoring services for the at-risk youth in his 20th ward (a ward that, clicking on the map to the left, reveals only one program that we at Tutor/Mentor Connection know about... that's one known program serving thousands of children who are at-risk for crime, academic failure, and continued poverty). 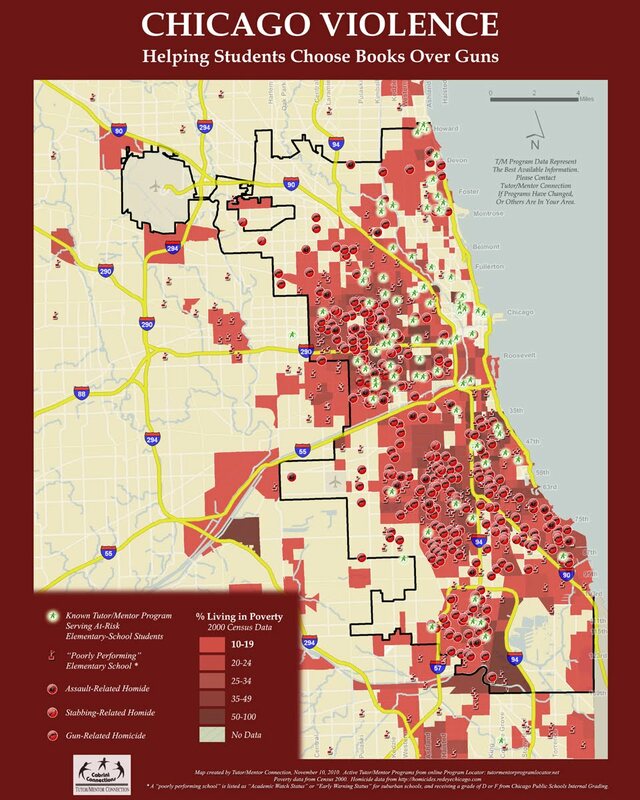 At the very minimum, I am hopeful that our political leaders take the lessons from a case study like Urban Prep seriously, and make a real effort to launch new research and new programs. If they ever need a map or strategies, I might know an organization that can help! So far in this series of blogs, I've discussed how Tutor/Mentor Connection (T/MC) maps (maps that were featured at a real live art gallery this past November) can be used by spiritual and political leaders to develop new quality tutor/mentor programs for at-risk youth. Today I’d like to look at one of the reasons these leaders should. T/MC occasionally features maps that piggy-back on the all the violence in the news. Teen violence is an epidemic that shocks us on what seems like a daily basis. Local commuter newspaper, The Red Eye, tracks the area's homicides and maps the locations of each crime. We try to take it a step further, by adding layers of poverty, poorly-performing schools, and neighboring tutor/mentor resources to the picture, to try and visualize where mentoring programs could best help steer the next generation of kids toward academic and vocational success, versus futures on the streets and in the jails (which by the way, ultimately costs taxpayers like us a lot of money, regardless of whether you care that kids are killing kids). Over the years many people have kindly pointed out for me that "poverty is not necessarily an indicator of crime." I would agree of course. There are many poor who are not criminals, and there are plenty of wealthy criminals. This is common sense. However, I point to findings by contemporary sociology and criminal justice academics like Melissa Deller, who clarifies that “factors often associated with poverty could affect a community’s crime rate more than simple income levels.” Deller tells us that these factors include “housing values and conditions” and “chronic unemployment" - which are clearly tied to poverty. She adds “education level” to the mix, which validates our use of low-performing schools in our maps. Finally, she considers “broken homes” a factor in predicting a community’s risk for crime, and it stands to reason that children from these broken families might find positive role models to fill the void at nearby mentoring programs, if they exist. But how successful can mentoring really be in addressing our crime and violence problems? 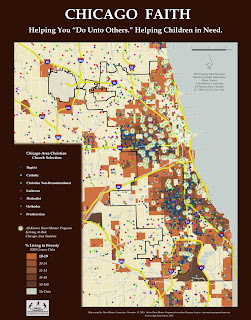 When clicking on the "Chicago Violence" map above, and taking a closer look at the crime scenes in relation to poverty, low-performing schools, and existing known tutor/mentor programs, consider the empirical evidence from a 1997 study of well-known mentoring program Big Brothers/Big Sisters (BB/BS), conducted by Public/Private Ventures (P/PV). The study looked at how youth that were enrolled in BB/BS fared versus a control group of students who were on the program's waiting list, over an 18 month period. In other words, all student in the study - including the control group - had the desire and motivation to be in a mentoring program. This is important. Very often, skeptics suggest that students in mentor programs do better than their peers because they already have the desire to seek out help. This study compares kids who want to be in a program, versus kids who also want to be in a program. Click here to learn more about the research method and sample. The results showed that those in the program were 36.7% less likely to skip classes and showed a 3% improvement in grades overall, versus the control group. Regarding crime and violence more directly, the research showed that those in the group were 46% less likely to use drugs, 27% less likely to use alcohol, and 32% less likely to hit someone when in a mentor-mentee relationship at BB/BS. The study is careful to point out that not all programs are equally effective, and suggests "prerequisites" for “effective mentoring programs.” Take a look at what Public/Private Ventures cites as prerequisites to building quality mentor programs that are effective in fighting crime, and then compare them to the building and leadership strategies at Tutor/Mentor Exchange. Then urge your spiritual and political leaders to do the same, contacting us for maps that will help them locate areas of need, and strategies that they can use to build new quality programs that support your community’s safety and well-being. Maps can be used by elected leaders to help quality youth programs grow in all parts of their districts. My last blog showed an overview of Chicago's wards and incumbant aldermen. More on city council later. Today, I would like to zoom in on a particular district, Illinois Senate 15th, currently represented by Reverend James Meeks, who just happens to be running for Chicago Mayor in the coming election. 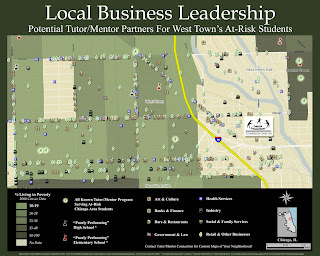 When Tutor/Mentor Connection (T/MC) makes maps that zoom into a neighborhood or district, we can reveal points of interest - community assets - that can be used to support or build tutor/mentor programs, in an effort to ensure that the third graders to whom senator Meeks refers in the quote above, do in fact receive the scholastic and decision-making foundation needed to remain interested and successful in school and beyond. Today, I am featuring a map (click to enlarge) from our recent map gallery that shows a thematic overlap between our politicial strategies, and our faith-based strategies featured in Part 2 of this "map gallery" series. As always, in today's map I show areas of high poverty and schools that are not meeting state and CPS standards, in relation to known tutor/mentor programs. Remember, the capacity of each of these programs on the map is far less than the enrollment of each of the overwhelmed and underachieving schools shown. With this in mind, ask yourself whether we need to build more programs to supplement the efforts of schools and parents, to make sure at-risk students stay on track for long-term academic and vocational success. Then ask yourself where these might be needed. This particular map reveals a selection of Christian faith-based assets that might take the lead in making this growth happen. Since we are featuring Mayoral candidate Meeks, the map features Salem Baptist Church of Chicago, which Reverend Meeks founded, where he worked as pastor, and where he remains a spiritual leader - not only for Salem Baptist's 24,000 followers, but also for the dozens of other Baptist congregations in his political district, represented here by dark blue crosses. Tutor/Mentor Exchange has a document called How Faith Communities Can Lead Volunteer Mobilization For Tutor/Mentor Programs, detailing how a spiritual leader like Meeks "can be delivering sermons on a regular basis, that tie scripture and service, and point members to tutor/mentor programs that already exist, or to neighborhoods, where new programs need to be created." Perhaps Senator Meeks can use his influence (spiritual and political) to lead other denominations in his district as well. Non-Baptist Christians on this map are represented by light red crosses. Each of these locations represent additional sites where congregations can meet to learn about tutoring and mentoring, and where church leaders can evangelize to get donors to contribute to the growth of programs. Reverend and Senator (and perhaps Mayor) Meeks is no stranger to the wisdom of mentoring. While he is probably more famous for speaking out on the problems created by inequalities in the education of our students, he has also taken action, having initiated a mentoring program called “It Takes a Village,” to provide support and assistance to pregnant youth and young mothers. We still do not have this program in our Program Locator, and would love to work with Senator Meeks to build new programs for the students in his district where our maps suggest a need. The last couple blogs in this series have focused on how faith-based leaders can point members of their congregations to programs that supplement the work parents and schools do to help students make better life decisions, get better grades, and ultimately contribute to our economy and society in positive ways. 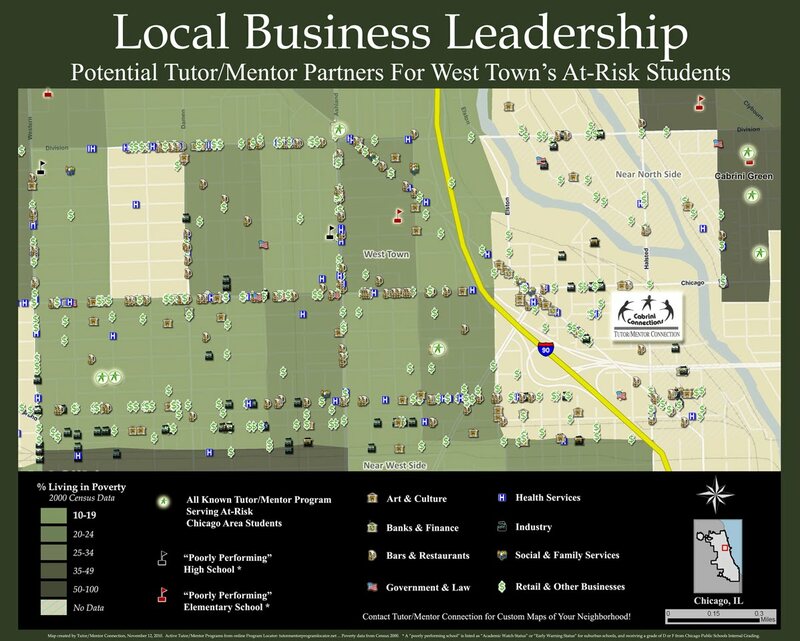 Tutor/Mentor Connection (T/MC) has the mapping technology to zoom in on any of these districts, to provide a detailed birds-eye view of business, faith, and other community resources like colleges and hospitals, that can rally together to provide a little extra help for local students. With a T/MC map in hand (we can customize map views for any political district, zip code, neighborhood, etc.) and ready-to-use T/MC strategies to serve as a starting point, political leaders with a vested interest in building new support for our kids can take a more focused and organized lead in supporting tutor/mentor programs in their districts. Check back tomorrow to see an example of how T/MC maps can zoom into political districts to reveal what's inside! As Hanukkah continues this holiday season, I have chosen to quote Jewish rabbi and philosopher Maimonides, from his writings in the Mishneh Torah, regarding charity or tzedakah. I am also featuring the map Tutor/Mentor Connection (T/MC) has designed to show the locations of over 100 known Jewish congregations (as exists in the T/MC database. Please let us know if yours is not here). It is our hope (not just during Hanukkah, but every day) to find spiritual leaders in these locations that might help us tie scripture to our mission... and help us make sense of our work to the area's religious community. Leaders at these locations have the power to increase the reach, frequency and consistency of tutoring/mentoring programs for the poor... ultimately helping thousands of kids make better decisions and find success in life, in spite of high concentrations of poorly-performing schools in high-poverty areas. It is our hope that our work contributes to safer communities and stronger economies for all in the future. 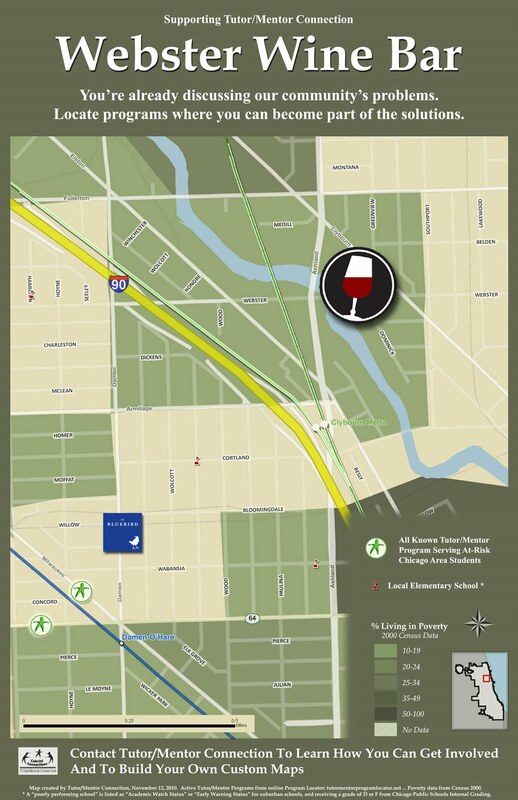 Looking at the map, Jewish congregations are typically located in more affluent communities, and many are clustered near I94 (a major artery leading into high-poverty communities throughout Chicago). Thus, many Jewish congregations are in strong positions to take leadership roles that point volunteers, donors, and attention to tutor/mentor programs that already exist... or to neighborhoods where new programs need to be created. This holiday season, you might choose to use our online map to locate a non-profit program near you or your congregation; programs like Cabrini Connections that would greatly benefit from a holiday gift of tzedakah. Many blessings, and much peace and good fortune to people of Jewish faith in our community this holiday season! Happy Hanukkah! Helping You "Do Unto Others." Helping Chidren in Need. Imagine if the evangelism of thousands of faith communities in the Chicago region was focused in part on connecting faith groups from more affluent parts of the Chicago region with tutor/mentor programs in high poverty areas. Maps can show where churches, mosques and synagogues are located. Faith leaders can use these to build communications strategies that engage their member institutions to help tutor/mentor programs grow, and to bolster programs that are already hosted within faith based institutions. "Every dot on this map represents a faith based organization. Some are in high poverty areas where tutor/mentor programs are most needed. Others are in middle class neighborhoods where people may be struggling to keep jobs and pay mortgages and deal with their own family health. Others are in areas of high affluence, where there may be more ability to give. In all of these communities we hope that groups are forming and reading [Mapping For Justice] blog articles... If you read and reflect on what we write each week, each of these dots will begin to have strategies that connect them to tutor/mentor programs in one, or more parts of the city, as well as to people in other faith groups who are discussing the same issues. Let us know if we can help your congregations form such groups." This particular map focused on a selection of known Christian churches in relation to known tutor/mentor programs. Of course, this is also Hanukkah season! So check back early next week for a look at Jewish congregations, via another map that is featured in this year's "Mapping Solutions" gallery. Map Gallery Online, By Popular Demand! As readers of this blog know, we at Tutor/Mentor Connection(T/MC) have spent the past several years using maps to identify and analyze areas of our city where support for at-risk youth needs to grow, in order to make our students brighter, our workforce stronger, and our streets safer. T/MC maps indicate areas and neighborhoods where at-risk youth might need additional support in their studies and life direction. The maps then try to reveal available resources that local tutor/mentor programs and community leaders can mobilize to improve that new support for students. Of course not everyone could make it to the border of the Lincoln Park and Bucktown neighborhoods of Chicago, so by popular demand (thanks to everyone who asked to see pictures), I’ve decided to put the gallery online this month. As I put the maps up, I will explain the reason I chose to feature these “samples” of what we can do with T/MC map technologies. This will serve to demonstrate our current mapping capacity, hopefully get you thinking a bit about how you could use the map (and what additional cities and neighborhoods you'd like to explore), and hopefully lead to a discussion of how we can find the investment needed in 2011 to use state-of-the-art GIS technology to better support students and the non-profits who serve them. If the response at the gallery was an indicator, you don’t want to miss this month’s “Mapping For Justice” blog installments. So go ahead and subscribe or bookmark us! And check back this weekend for the first set of “Mapping Solutions” gallery maps.